Offering you a complete choice of products which include torsion testing machines. 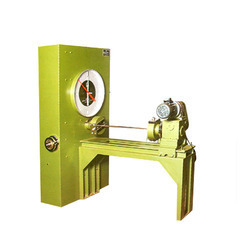 We are actively devoted towards manufacturing of a quality approved Torsion Testing Machines that are used for conducting torsion and twist on metal wires. Our provided testing machines are available in different designs and specifications as per the demands of the clients. Apart from this, these testing machines are highly appreciated in the market due to their high strength and sturdiness. Looking for Torsion Testing Machines ?